For many Americans, life gets busier as they hit the latter stages of early adulthood. People start families, add parental responsibilities. Meanwhile, their careers continue to advance. Eventually, they are hauling their children from soccer game to dance recital and other commitments. Finding the time – not to mention the ambition – to exercise can be challenging for both men and women. Seeking tips for women in their 30s and 40s, PhillyVoice spoke with a pair of Philadelphia-based personal trainers, a sports medicine physician and a dietitian. Collectively, they offered some simple advice to women looking to begin exercising again after a long layoff. To start, they suggested developing a game plan. "I think the goal is to write something down and have something help you stay consistent," said Dr. Ryan Schreiter, a Temple University Health Care sports medicine specialist. "Because you will see the benefits of it." Because it can be difficult to maintain consistency and establish new habits, they suggested finding a friend and picking a workout regimen that will be enjoyable, whether that is yoga, strength training or jogging. 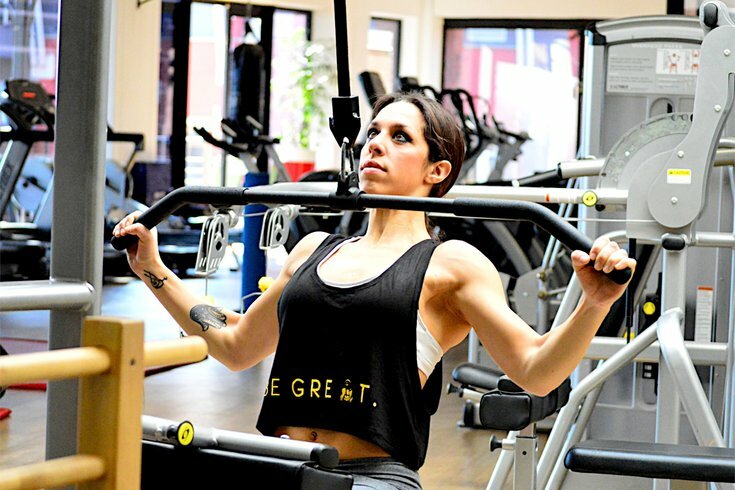 "Give yourself some time to find something that you enjoy doing," said Jayel Lewis, a certified personal trainer at Fitler Club in Center City. "It doesn't have to be something that you dread. It should be something that you're looking forward to. "Try to do something on your own and then try to do something with someone else so that it's not only a fitness component, but ... a social component as well." The American Heart Association recommends adults exercise at least 150 minutes each week, including at least 20 minutes of vigorous exercise three times each week. But ramping up workouts too quickly can cause injuries and other problems. Instead, Robyn Weisman, a certified personal trainer, suggested women begin exercising two or three times a week and gradually increase the frequency. "A lot of people overtrain in the beginning especially," Weisman said. "Starting out, they're really excited and they want to get back into it. But you need to realize your body is recovering. "Sleep is very important. That's one of the best recovery things you can do for your body – getting enough sleep. Especially as you get in your 30s and up, your body isn't going to recover" as quickly. Schreiter and the trainers recommended a combination of cardiovascular workouts – aerobic exercises like running, cycling or swimming – and resistance training – pushups, air squats and body weight exercises. Weisman suggested that an indoor rowing machine is a great workout that creates less stress on the joints and helps with posture. She added that elliptical workouts, yoga and tai chi also are beneficial. "Stretching is amazing," Weisman added. "I do sessions just with stretching. It helps to elongate the muscles." It is important, Schreiter stressed, that women do strength training on top of cardiovascular exercises, especially as they approach menopause, which typically occurs sometime during their late 40s or early 50s. As estrogen levels drop, that exercise combination will help decrease body fat and strengthen bones. "From a hormonal standpoint, that will affect their ability to stay consistent and see consistent muscle gains or cardiovascular gains," he said. Additionally, women need to make sure their diets include sufficient levels of iron and calcium, said Josephine Raum, a bariatric dietitian at Cooper University Health Care. Due to their menstrual cycles, women are more vulnerable to low iron levels than men, Raum said. Iron is needed to transport oxygen throughout the body. With insufficient iron levels, the body cannot create enough healthy oxygen-carrying red blood cells. "If you're doing a vegetarian source of iron, like beans or tofu, you want to put something like broccoli or bell peppers with it," Raum said. The Vitamin C in those vegetables will help the body better absorb the iron. Calcium is needed to prevent bone loss. Women should do strength training on top of cardiovascular exercises, especially as they approach menopause, according to Dr. Ryan Schreiter, a Temple University Health Care sports medicine specialist. As estrogen levels drop, that exercise combination will help to decrease body fat and strengthen bones. "Working out, especially weight training, is fantastic for keeping your body mass," Raum said. "We really promote that, especially for women, because it really helps stimulate your bone growth. Your bones are regenerating all the time, creating new little cells." Raum suggested people eat 10-15 grams of protein within 30 minutes of working out, mixing it with carbohydrates. The carbs will replenish lost energy, ensuring the proteins are used to rebuild the muscles. But she cautioned people against eating too many carbs, noting they leave you feeling hungry and are high in calories. She also encouraged people to be mindful of the times they're eating – and the reasons they're eating. "A lot of times, it has nothing to do with hunger," Raum said. "If you're trying to make diet and lifestyle changes, be aware of the way food plays a role in your life." Tracking calories for a week can help people identify the areas in their diets that need intervention, Raum said. "Just try to start getting your meal frequency down and track to see what your calories are," Raum said. "I wouldn't try to change everything at once, because it can be very overwhelming. But you have to have a baseline." Additionally, Schreiter stressed the importance of women making annual appointments with their primary care physicians and taking preventative measures, including blood work and various screenings.